Members of the Lockyer Organics Group were recently treated to the concept of environmental landscaping. The Laidley visit, was to the garden of Dave and Pam Grubb, who apply environmental principles in their two acre garden. It is a revelation in demonstrating methods of garden design and construction that work with the environment, rather than working against it. Dave lead the discussion by saying that " …. 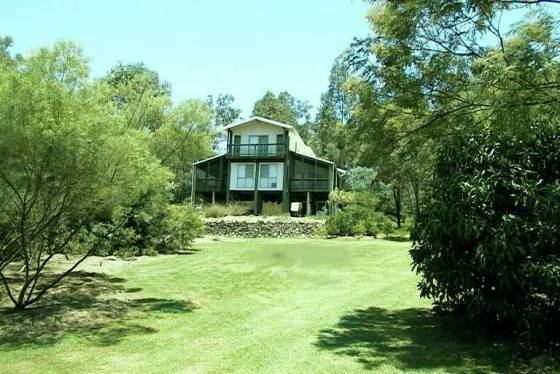 we like to think of it as a habitat rather than merely a garden, a place for the local fauna as well as plants.In designing and building with the environment, we encourage the local wildlife, with a wide variety of birds, eight species of frog, different snakes and lizards as well as a visiting wallaby. This is different for this area, given the suburban nature of many gardens. With our policy of reducing grass areas, we are also able to encourage some of the vanishing species of the local flora." Two culverts discharge storm water onto the block - to the west and east, and the subsequent drainage control demonstrates that, with some initial hard work, even drains can become a garden feature, and that storm water can be controlled to the benefit of the garden, by means of water harvesting. "Most of the planting is five years old," Dave continued, " and with our policy of water harvesting and planting with a blanket mulching principle, we get the results you now see". One particular feature of the garden is the use of rock, throughout the drainage system - mostly built by Pam, and in the dry stone walls built by Dave, to create terraced planting areas and so again control the drainage. 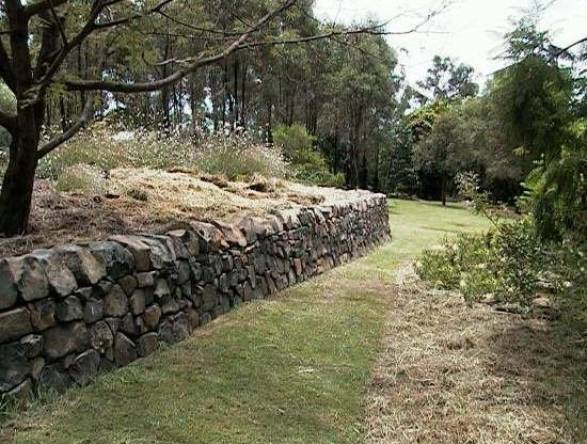 A completed section of Dave Grubb's dry stone walls – no mortar – no concrete!! 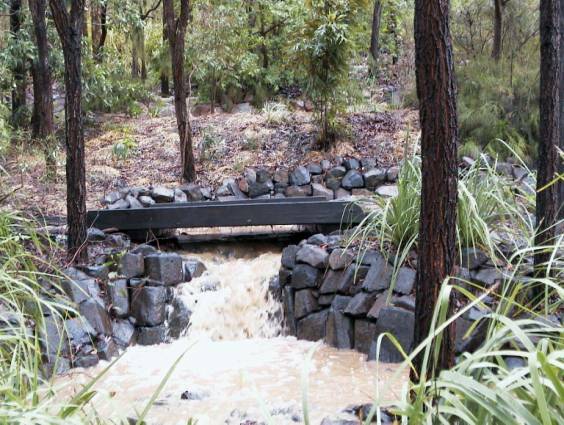 "In our climate", said Dave - ex landscape lecturer at Gatton College, " the control of drainage water in storm events is critical, particularly on slopes. I hear too often of gardens being washed away. Even our steep driveway is designed for zero run-off. Gardens on slopes must be structurally sound. The 'engineering' must be considered before the aesthetics - but that's engineering without concrete - it is possible." The group inspected the vegie patch, organic of course. The circular design enables access with a vehicle, via the grass spoon drain diverting storm water from the eastern culvert. Members of the group had not seen some of the food plants growing, including cassava, the preparation of which was demonstrated by Pam. "It's an amazingly versatile food plant - sweet or savoury , and freezes so well - it grows so easily and almost on nothing!" The visitors were later treated to a cassava and coconut pie - Pam apologised that …. "the coconuts are not from the garden!" The abiding image of the house and garden is one of harmony with the environment. Pam's final comment being that …. "Even though we have a pole frame house - I think we've more than replaced the trees used." Pam and Dave's house and garden setting - working with the environment. The Lockyer Organics Group, led by the enthusiasm of Noel de Closey, is rapidly growing in numbers and is open to all - home gardeners and professional growers alike. New members are welcome, no membership fee - just an interest in organics growing is all we ask! Members of the Lockyer Organic Group (LOG) are enjoying the diversity of their monthly meetings and for their October meeting they were joined by members of the Darling Downs Natural Growers Group (DDNGG). This pro-active group are developing a 'model' garden at their Toowoomba, Gogg Street site and their visit down the range, enhances the rapidly expanding reputation of LOG. Both groups were the guests of Ray and Fay Huggins, commercial organic growers on Harm Road, Glenore Grove. Ray entertained the group with his humour and anecdotes, but always returning to the seriousness of his business. The Huggins have been growing since 1985, but then they grew crops conventionally, but with low prices and many setbacks they looked for a 'niche' market.Organic produce provided the 'kick-start' with Ray discovering the unsatisfied, niche market of organically grown vegetables. Through the ensuing years, the Huggins have developed strong market links, and they are now a major supplier of organic carrots to Melbourne. This was the first visit by LOG to a commercial grower, with Ray and Fay giving generously of their time, expertise and produce! They answered a barrage of questions: how organic methods appropriate to a small block may be quite impracticable for commercial holdings; how important are growing through appropriate "windows of opportunity" and of course niche marketing. On a large property, fluctuations in fertility and soil pH and of course the vagaries of the climate can quickly alter the balance of the cost-benefit ratio. But Ray was quick to point out that in a bad year organics will still do better than conventional growing. Had there been any doubts in the minds of the group about the feasibility of commercial organic production, they were dispelled, particularly after seeing and sampling the quality vegetables that Ray and Fay produce. And the secret of their success? "No secret" said Ray, "just hard work". However, through his smiles and jokes emerged the thinking grower with hard work based on sound knowledge and understanding of the soil - this is the real secret of his success. The Lockyer Organic Group welcomes new members - no fee just an interest in growing. Wealth and Safety? - the low-down on genetically modified food. The public forum (27th July), hosted by the Gatton College Horticultural Society and LOG was another huge success for these enterprising groups, with over forty people in attendance all thirsting for knowledge and information about the issue of the genetic modification of our food. Richard Williams, Professor of Horticulture at Gatton, opened the proceedings with an overview of the history of plant (and animal) selection and improvement. "Genetic 'engineering' is a natural process, and is not some mysterious and totally unnatural technology creeping out of the scientists' imagination", Professor Williams told the audience. He went on to explain that, ".... this is an extension of what mankind has been doing for thousands of years - breeding and selecting better and more useful plants and animals. The new technology simply enables us to do this more efficiently and, generally, with greater safety". The guest speaker, Professor Ken Reed, Director of the QDPI (Queensland Department of Primary Industries) Agricultural Biotechnology Centre, focused the attention of the group by handing round genetically engineered products, which included a tin of flavour-some tomatoes and a blue carnation. He stimulated debate by stating that, ".... the reservations expressed by the public, in terms of the safety of genetically modified plants and animals, are acknowledged by the scientific community, but I assure you that scientists are equally concerned that the technology is used wisely and safely". The audience found no solace in his aside, that some conventional food production systems are potentially more injurious to health. Was Professor Reed playing devil's advocate when he said that " ... plants have been doing a great job for millions of years in perfecting the nucleus of cells and the genetic material therein. It's a little arrogant of scientists to believe they can improve on this simply by manipulating the genetic material"? He didn't appear too comfortable in his role. He also stated that the current techniques of 'genetic manipulation' are rather hit and miss although in time techniques will become more refined. The main concern expressed by Professor Reed was the role being played by the multi-national corporations. Most of the current patents on Genetically Modified Organisms (GMOs), are held by four multinational companies. Genetic engineering is big business. Big business and the environment do not mix - this above all other issues was the major concern of the audience. Question after question raised issues relating to the "wealth and safety issues" of GMOs. Professor Reed could only agree. No answers could be given, only assurances that concerned scientists will not destroy the environment, (mad cow disease and the nuclear bomb were also raised as comparisons during the heated debate). It was accepted that where genetic engineering could improve the human lot that was fine. The problem is that (often) good news is no news, and only the down side of major issues, such as genetic engineering, is widely reported. It was a highly stimulating evening, but as one observer at the meeting said ... " It's such an important issue, it's a pity there wasn't a speaker against genetic engineering - we could have had a real ding-dong of a debate!" Irrespective of the merits of the issue, the Horticultural Society at Gatton College and LOG must again be congratulated for presenting a great evening, full of interest and debate. The last meeting of the Lockyer Organics Group (LOG) for the year (and the millennium!) saw the group travel to the Polynesian island paradise of Tuvalu. The speaker at the LOG meeting of November 27th was Laumua Kofe, a resident of Hatton Vale, late of Tuvalu and New Zealand. Through his words the LOG group and visitors from the Brisbane and Lockyer Permaculture Group (BLPG) were taken for a trip to the islands of Tuvalu (the old Ellis Islands). Lamua described the main island as a flat coral atoll, only a few metres above sea level, with poor soils but abundant fish. The main crops are taro and sweet potatoes with paw-paw and coconut the main fruits. All crops have to be grown on organic matter derived from bush trees and manure from the introduced pigs and chickens. The coconut is fed to the pigs, the question of coconut flavoured pork, remained unanswered! Significantly, much of the planting and seed sowing of introduced vegetables is carried out in phase with the moon - planting on the rising moon. This has been part of the culture of the growing practice of the islands 'since time immemorial'. This is hardly surprising, given the influence of the tides on the islanders' way of life. Planting in harmony with the moon is still an alien cultural practice for most 'European' gardeners and growers and is still whispered in the same breath as witchcraft by many. Here science may not offer any immediate answers. But the experience of Lamua, and some of the LOG members suggests quite categorically that crops DO perform better when planted with the new moon, " … as the moon grows with more vigour, so do the crops with the life force of the moon". We as a society should not be so dismissive of that which we do not understand. But for the interested grower, no worries, you do not have to plant in the middle of the night. Simply obtain a moon-planting calender - indicating crops, and timing of planting. One of Gatton's respected suppliers of agricultural requirements has the calender in stock. Whilst the soils of Tuvalu may be depleted, they do not suffer from a lack of water - it rains all year. Another benefit of being a small group of islands (the name meaning 'eight islands') is that pest pressure is non-existent "Simply plant the taro" said Lamua, "and watch it grow, the perfect no-work crop". But having said that he finds that here in Australia, even taro needs watering, but still suffers very few pests. As with most crops, it needs a lot of water but will not tolerate water logging. Some taro plants were available to members. 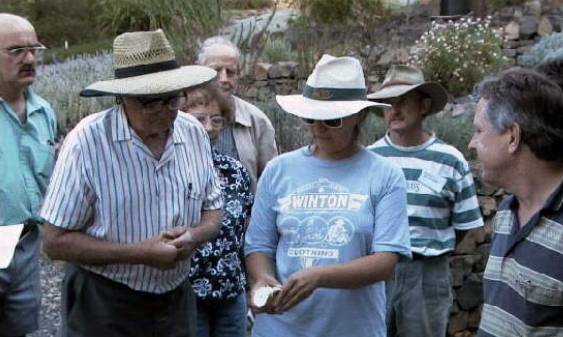 This is another benefit the group offers, plant and seed exchange as well as, of course, the exchange of ideas. The meeting of the 27th offered a cultural exchange also. The LOG is indebted to Lamua and thank him for giving so generously of his time. Thanks also to members of BLPG for swelling our numbers to an all time high. 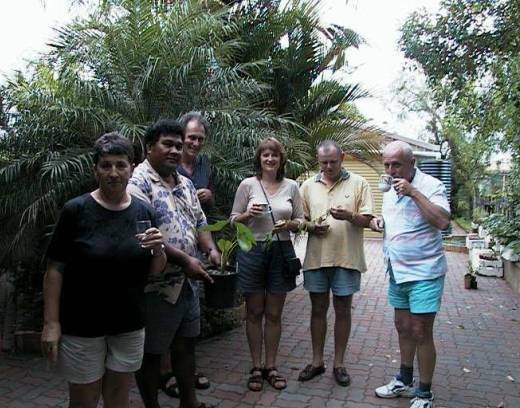 The venue for the meeting was the small garden of Paul and Tessa Hutton, at Laidley. Small in area but packed with produce, interest and great ideas. Abundant strawberries grown in 'styro' boxes - impossible land fill, great growing containers. Tomatoes neatly trained up star-pickets and stakes - being in isolation - no fruit fly. Raised beds for vegies and other salad crops. Even a rain forest patch, with a hive for native bees. The list goes on. Great garden. Great talk. Great Saturday afternoon. Why not join us in the New Year? LOG returns in the New Year with its meeting on 22nd January - the topic will be looking at insects to help us to decide whether or not they are indeed - "Friend or Foe". The venue will be Lot 3 Sandpiper Road, Regency Downs Until then may we in LOG wish all readers a safe and productive festive season. Whether organic or not! An interesting talk, a "cuppa" among friends and a chat : What better way to spend an afternoon!! !